4.94 points at 16 votes (rank 779). 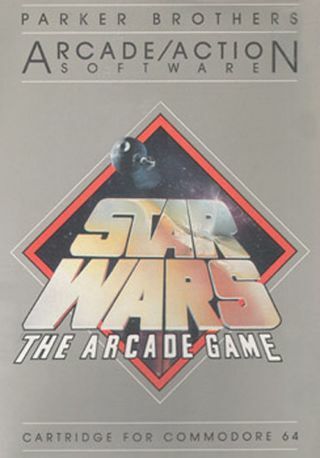 Star Wars is the conversion of the Atari arcade machine. 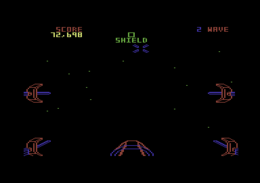 A remake was published by Domark in 1988. 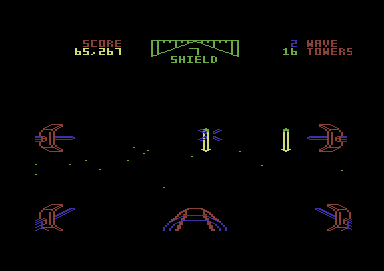 This game was exclusively released on cartridge for Atari platforms and on the C64. 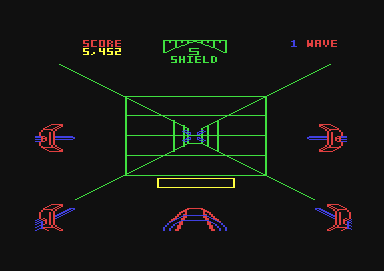 A ZX Spectrum version was finished but never published. Parker retreated from the video game sector a short time later probably due to the video game crash. 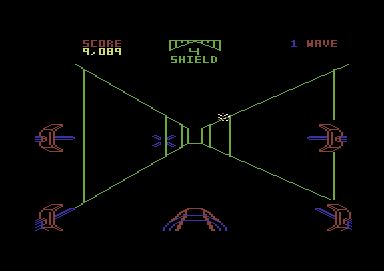 The game consists of three sections that repeat with rising difficulty until the player has used up his shield energy. Section 1 - Space battle: In the first section you need to defend yourself against the TIE Fighter that protect the Death Star, to reach it. For this you need to shoot the lasers of the TIE Fighters, as well as the TIE Fighters themselves. Section 2 - Surface of the Death Star: In the second section you need to shoot the defence cannonry on the surface of the Death Star. Section 3 - Trenchrun: In the third section you need to fly through the Death Star trench to shoot a torpedo into an air shaft. In the trench itself there are turbo lasers and barriers. The turbo lasers and their missiles can be shot, you need to avoid the barriers. The aim is of course to shoot your torpedoes, so that the Death Star explodes. 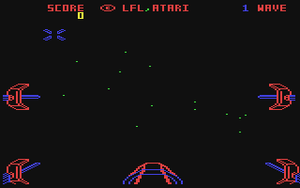 The graphics are an interpretation of the Atari arcade machine. It is simplified strongly and does only rudimentarily look like the original. The blaster bolts of the TIE Fighters look like heaps of pixels and the TIE Fighters explode but do not fall apart. To steer the joystick in port 1 is used. The aiming facilites of the spaceship follows the joystick movement. As with proper flight simulators is the horizontal axis of the joystick mirrored. If you move the joystick upwards, the crossline moves downwards. You shoot with the fire button. The horizontally mirrored controls can be sidestepped by playing with the keyboard and changing the key assignments. In section 1 should the TIE Fighters be shot as quickly as possible as these set free 4 energy bolts again and again and you are then always occupied with the bolts. Currently there are none known. Spaceball: "Although I am an absolute Star Wars fan I cannot really get into this title. The game is a nice shooter for its time. Not more and not less. The cartridge itself however is an interesting collectible as it is very rare." Robotron2084: "A close to the edge arcade machine conversion with sprites that pretend to be vector graphics. For Star Wars fans maybe bearable. But I am none: 3 out of 10 points." Star Wars (Parker Brothers) in the Killer List Of Videogames. This page was last modified on 1 March 2015, at 17:14.